allow researchers to study and design cache easily and efficiently. allow system administrators to analyze and visualize their cache performance easily and efficiently. The KEY philosophy is that we would like to design a cache analysis platform that is efficient, flexible and easy to use. With these in mind, we designed PyMimircache in Python3 for easy usage and we implemented state-of-the-art algorithms in C as backend together with parallelism for efficiency. However, PyMimircache can also be used without C backend. Besides, PyMimircache allows user to plug in external reader for reading special data and allows user to write their own cache replacement algorithm easily. PyMimircache supports comparison of different cache replacement algorithms, including Least Recent Used (LRU), Least Frequent Used (LFU), Most Recent Used (MRU), First In First Out (FIFO), Clock, Random, Segmented Least Recent Used (SLRU), Optimal, Adaptive Replacement Cache (ARC) and we are actively adding more cache replacement algorithms. For an extensive list of supported cache replacement algorithms, see documentation. Best of all is that you can easily and quickly implement your own cache related algorithm. For all cache replacement algorithms, including the ones built-in and the ones you implement yourself, PyMimircache supports several different kinds of calculation and comparison, there is nothing you can’t do, there is only things that you can’t imagine. 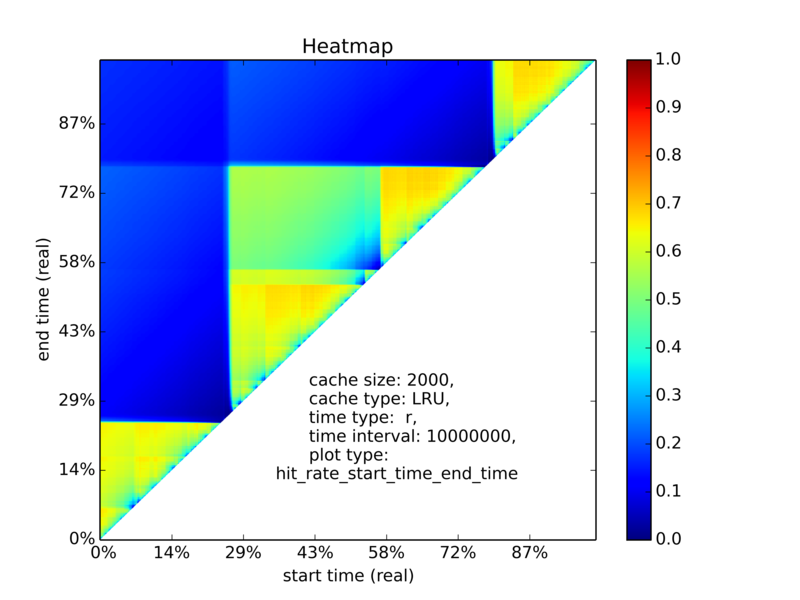 To help you better evaluate different cache replacement algorithms, we also include a variety of visulization tool inside PyMimircache, for example you can plot hit ratio curve (HRC), miss ratio curve (MRC), different variants of heatmaps and differential heatmaps. For LRU, it also supports efficient reuse distance calculation, reuse distance distribution plotting and etc. Another great usage of PyMimircache is understanding workloads. so that you can be the tailor of your cache, design better strategy to cache your data or know why your cache has certain behavior and how your cache behaves with time. In this part, we have figures that show you the hit ratio over time, request rate over time, object popularity distribution, reuse distance distribution, and different types of heat maps showing the opportunity of getting better cache performance. Three feature provided by PyMimircache are high performance, flexibility, and easy usage. Performance: PyMimircache uses CMimircache with state-of-the-art algorithm as backend for best performance. Flexibility: PyMimircache can also be used without CMimircache, thus using all Python based modules. However, both usages have the same interface, no need to learn different tools. Besides, PyMimircache supports three types of readers, PlainReader for reading plain text data, CsvReader for reading csv data, BinaryReader for reading arbitrary binary data. We also supports VscsiReader for reading vscsi data, which is a special type of binary data. If your data is in special format, don’t worry, you can easily implement your own reader, within a few lines, you are good to go! Easy Usage: We provide Cachecow as the top level interface, with provides most of the common usages. Besides, you can easily plug in new algorithms to see whether it can provide better performance than existing algorithms. Connection with Memcached and Redis. PyMimircache and CMimircache is created by Juncheng Yang of Ymir’s group at Emory University with help from a lot of others, both are released on public domain under GPLv3. PyMimircache is maintained by 1a1a11a. This page was generated by GitHub Pages.